If you have been antiquing lately you have probably seen these old pickling jars. They seem to be the rage right now and even Pottery Barn is selling them as “found” objects for $179.00. I was in an antique mall a few months ago and these jars were EVERYWHERE. I bet twenty dealers had them in their booths. Some said they were French and some dealers said they were from Hungary. I don’t know which is correct but at $149 for the large one I knew they were not coming home with me! 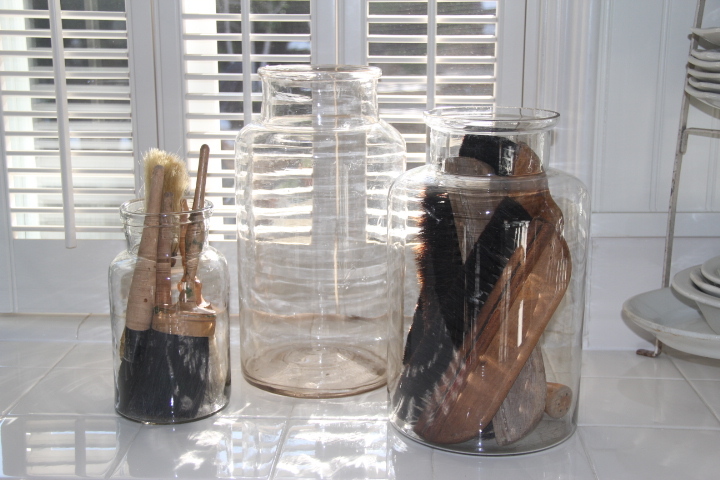 I have always had a thing for old jars so of course I loved these… but not the price. While out junkin with my friend Lynn from The Vintage Nest I found these two large vintage jars. No, they are not the same as the pickling jars but they do have the bubbles and old wavy glass that I love. They are even larger than the PB ones and cost just pennies compared to theirs. 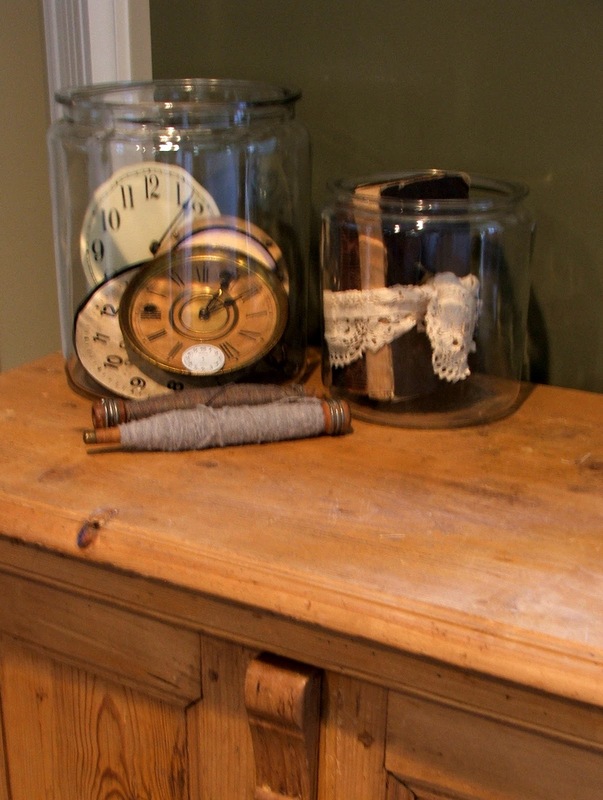 I have them on top of a antique pine dresser and filled with clock faces and vintage books. If you do want the real thing I found an on-line shop that sells the large jars for $90.00. This is the least expensive I have found. You can find the ones below at Debra Hall Lifestyle. Of course, if you are cheap like me you can check out thrift stores and antique malls for similar jars. I like my two just fine for $5.00 each! PLEASE VOTE FOR ME AT Cheap Sally once per day. Yours look great and what a deal. I don't understand why these jars are so high. I like your version best. Pottery Barn is just crazy on some of their prices. At least now, I know what an antique pickling jar is! Nice finds Sherry! I love how you put the clock faces in there. Love the spools too. Sherry, in several decades I have never seen these in France. The French use ones like the brand l'Ideal or Parfait and other unmarked ones that tend to be slightly green. I'm betting these are Eastern European, as that area has now been raided for linens. They sure are pretty, but that's out of my range too!! I'm with you. Your jars make a lot more "cents" to me! Hope you're having a nice weekend. I love your jars and how you used the clock faces in them, I can't imagine paying that price for something that could break! The PB jars are super cool, but the price is crazy! I would be perfectly happy with your jars and you made them look super cool! Sherry those are lovely! I really like how you displayed them as well. You found some nice jars and displayed them so well!!! I also have a thing for old jars and bottles. I have never seen those pickling jars before and wonder if they had some sort of lid?? I have many from the 1800's and they are nothing like those….you did well to pass those up!!! $5 EACH?? That's got to the the steal of the year! I love the clock faces in your jar. I actually bought three jars just like the PB ones this summer–I paid $100 total, and thought that was a pretty good deal…until now! You got such a great deal on those!! Once they are filled, you can't tell the difference! The look is the same..great job! So pretty and at a great price! Love the contents, nice touch! Love the clock faces in your steal of a deal. Love PB, but so expensive. And don't you just love that term "found"?! Che belle queste piantine con i fiori all'interno!! Love the clock faces in it….clever and fun Sherry! I don't think I've seen any antique pickling jars, but I will be on the lookout for them now. Definitely like the price of your jars much better than PB's. I love the ones you found, Sherry! I always have to chuckle when I see certain things in the PB catalog and know you can find similar for less. I love the clock faces in the larger one. How cool! I haven't seen those at all but I don't think I really knew what I was looking for ~ Now I am going to see if I can find them though ~ I love them! I like yours Sherry! They look great. 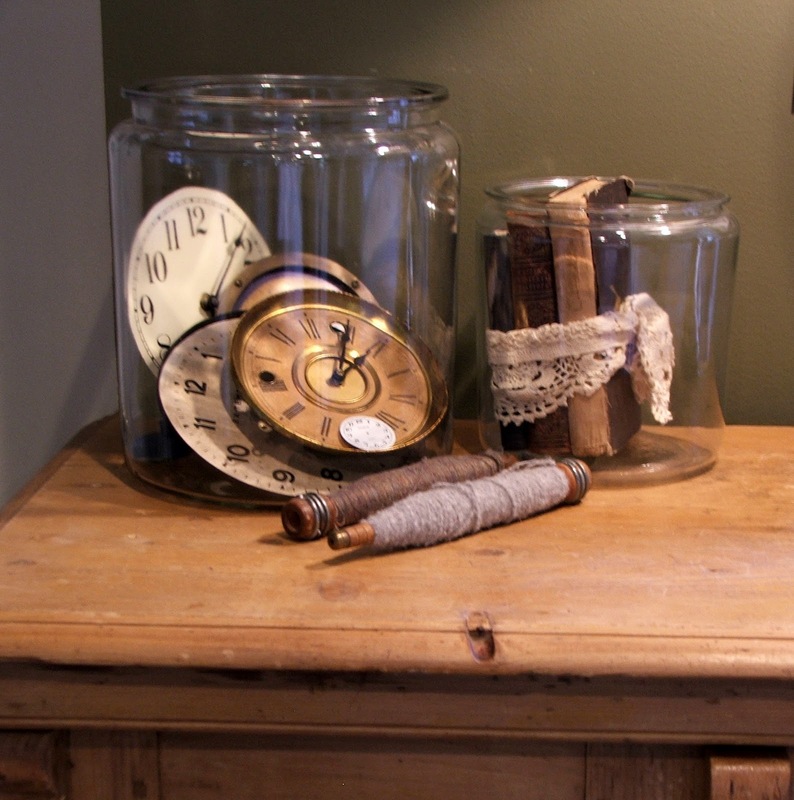 Looks like you "found" a deal on your jars and they look great with your clock faces,vintage books and spools of yarn. Way to shop! 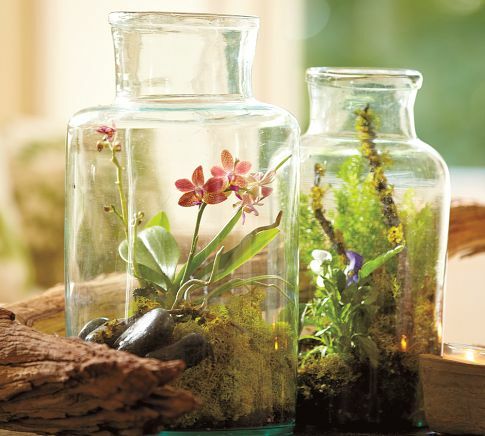 Love what you did with your jars. They can be pricey but thanks for the market update! Just what I needed. I love old battery jars. Have a few and love their square and rectangular shapes. I love the way you have arranged yours and the items inside them! What I wouldn't give to have the ones my grandmother had!!! I like how you used your jars. Placing collections of things in them is a fun way to display them. I really like the one with the clock faces! I like your finds…and way better price. I mean really? It is still just a jar! Love the look of PB…just don't buy there! Sherry I love the way you have filled yours with old clock faces! And I'm with you, I'll take beautiful $5 jars over more expensive ones any day! oh sherry, i have several of your $5 jars and never thought to use them as "display" cases. great idea and i agree that $149 is way too much to pay for old glass! So be much better than the on versions-not to mention the vast improvement in price. What a wonderful idea to add the planting to the jars.. I use them mostly for soaps etc. Have a great weekend! I like your version better than Pottery Barn. Their prices are ridiculous. I like the jars but agree 100% with you…the price seems ridiculous. I like your substitute jars and the price is certainly right! I've noticed those jars, too. I've found some similar to them…but I really had to look around to find them. I don't understand why they are priced so high, either! You got some beautiful ones. Thanks for sharing! I have never heard of these jars, but I am going to keep my eyes open now! I am so jealous that you and Lynn were junking! I bet she was out of the loop for a while with the wedding! Oh Sherry I love clock faces and you've given me a great way to display them. Beautiful. Great job on the price! And nice display. I love the jars you found. They look great with the clock faces and books in them. I too love old jars, there is so much you can do with them. Although I wouldn't pay a really high price for them either. Complimenti il tuo blog è bellissimo. What a great find, Sherry. Some of the prices are just out of sight, and so are most of the reproductions! I think anytime you find something that satisfys your objective, it works. You have such great style and your bottles look terrific! Thank you for sharing this creative and informative post at Potpourri Friday. I appreciate your participation! Nice deal on your jars, Sherry. I love the vignettes you created. I actually have a couple pickling jars, and there is just no way I would pay a PB price for one. Mine came from garage sales. What a find! Those prices are crazy so I'm glad you found these lovely alternatives to the antique pickling jars. Hope you have a great week ~ please come say hello sometime! Sherry, thanks for sharing these at my party. Hmmm. . . I've not seen the pickling jars in my antique shop visits but they are neat! I LOVE your jars and what you put in then! Such a great idea to add the old clock faces and that little bundle of books! Hi there! Thanks for the mention of m pickling jars in your post at Debra Hall Lifestyle! I just became a follower of yours and had no idea you had mentioned me your post!! LOve your blog….